July is here and it is time for a new steed of the month! 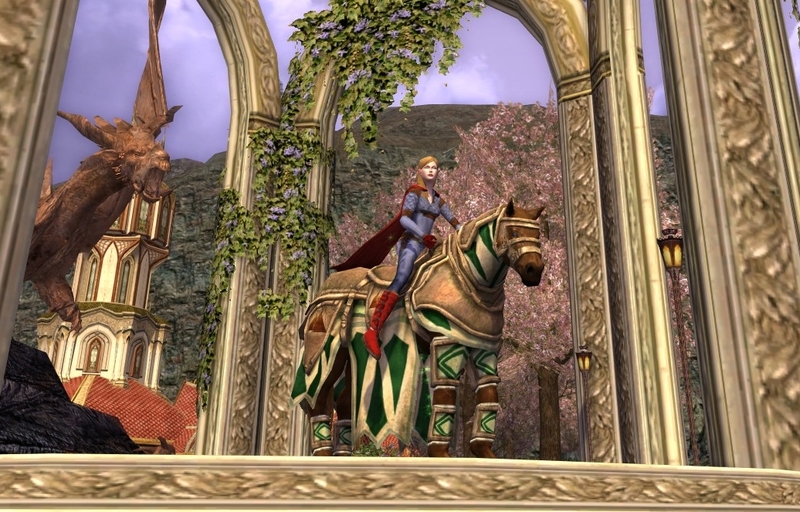 As always, every steed in lotro can be found at All the Steeds, here at the danania.net site. July Steed is the Steed of the Iron Hills. When purchased from the store, the Steed of the Iron Hills comes with 4 pieces: Halter, Caparison, Leggings, and Saddle. The barding for the Steed of the Iron Hills is a faded soft leather look with images of the Hills, set in orange on the halter and the caparison. Its rough leather look reminds me of the Steed of the Hunter, but the mid-drape section of the caparison is more similar to that of other lightly armored horses like the Steed of Nightwood. Its leggings are uniquely its own. As a Warsteed, the cosmetics are light colored. The light and tan colors look much better on the brownish colored steed than the grey toned steeds. The Chestnut color hides all work well. This steed almost inspired me to buy the Flaxen Chestnut hide color, but I think I will wait for that color to go on sale. Steed of the Iron Hills: Here is the basic horse. He is a dark brown horse with leather outfit, orange mountains in the pattern, and greyish green barding. 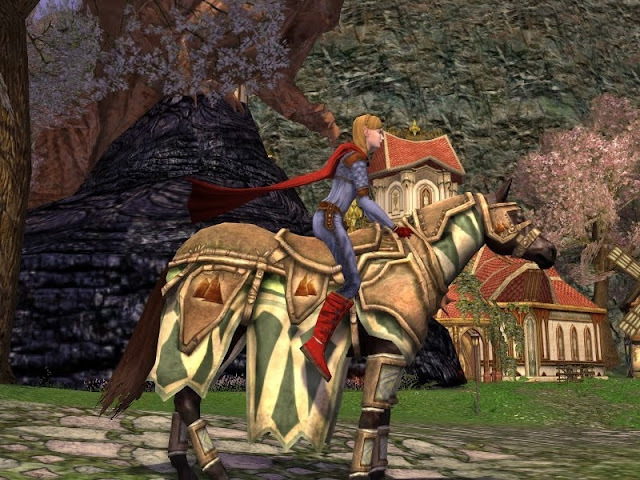 The Warsteed cosmetic is similar to the basic horse. 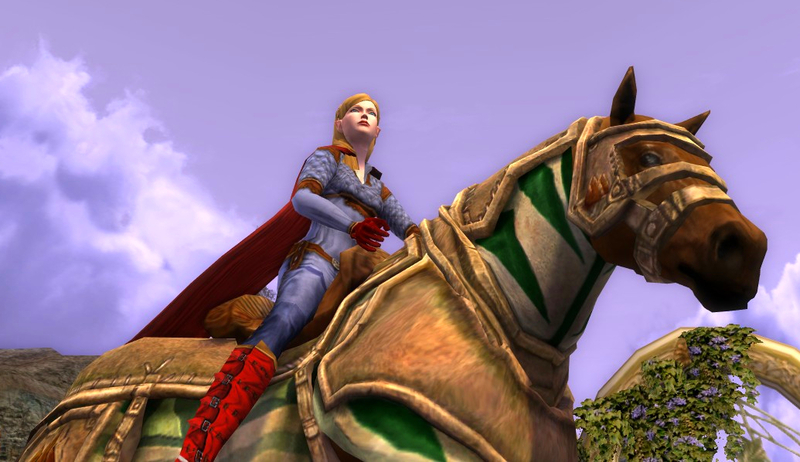 EDITED 07/02/13 evening: All orange mountains and striping from the basic horse are included in the Warsteed cosmetics. :) Thank you commenter Sam for setting me straight. If you viewed these pictures within the first few hours after this article posted, you saw these same pictures with a different saddle (I left the Steed of the Hunter saddle in the top cover picture). Here is the Warsteed cosmetic in crimson with a Red Roan hide. The orange mountains accentuate with the brown hide. This shot really shows off the Leggings which are snazzy! The leggings cover both the upper and lower parts of the legs. Umber?? Oh my. I would have never thought to use Umber on a cosmetic as I tend to be vibrant; however, it really works with this steed. The umber shade of brown is very hunter-friendly. Here I matched it with the sleek Black Chestnut hide. I love the sharp look of the bold colors like Ered Luin. I complemented it with an equally bold Black hide. Mebbe that is just what a tan subtle Steed of the Iron Hills needs... a bold vibrant blue. The green coloring on the mid-section of the caparison is not dyeable, so choosing a green dye on the part that is dyeable really blends well. The Forest Green is vibrant yet offers a good blend to the rugged look. Thanks for showing us the steeds each time! Hmm, my warsteed appearance for this horse has a saddle that looks exactly the same as the basic horse, and the mid-section orange mountain is there too. you never said though what that spectacular red-and-blue accessory on its back was...! Really appreciate you continuing to provide the community with insight into the Store Mounts so we can make informed decisions, Danania. I don't have every steed in the game. This horse is my 102 out of the 109 steeds in the game. Wow! And the steed collection continues! Exciting stuff, and I love the colours! I just went through your complete mount list and compared it to my own, and I got a few questions. Are you sure (46) Wayward Easterling Horse and (49) Prized Easterling Horse are not the same steed? If not; then you must tell me where to get number 49. I can't find "Bree-steed" in your list. This is a steed you got if you bought the SoA Gold Edition. Also, I added "War-steed: Light/Medium/Heavy" to my list, since this one belongs under the mounts section. This should make the total 110 or 111, depending on the Easterling horse. Okay, I just went to Stangard and I found the Prized Easterling Steed and the Wayward Easterling Steed, so nevermind. But that should make the total 111. I don't know enough about the tack on war horses historically to understand what the function is of the long central drapery. Do you know if that is just a design idea or were there once such long drapes? Wonder what they did besides drag the bushes? To Simen... I'm glad you found the Prized Easterling Horse! He was added in one of the updates... U10 I think. If you are a Founder (or got the horse in Yule festival 2007 random gift or got it from "SoA Gold edition"), this horse is called the "Bree-steed". 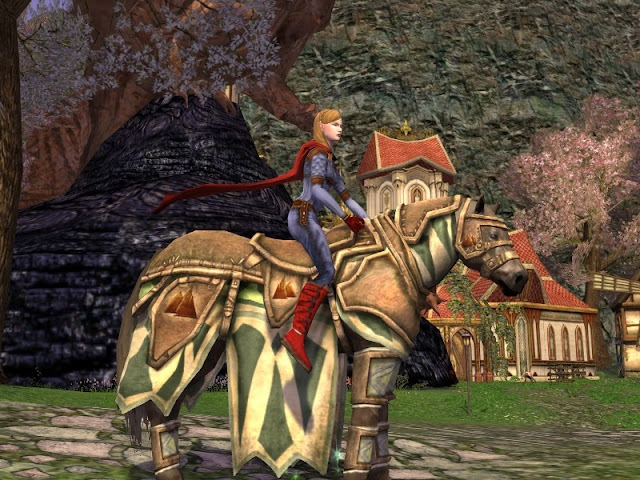 For non-founders, the horse is available at Hengstacer for coin and is called "Bree-starter". 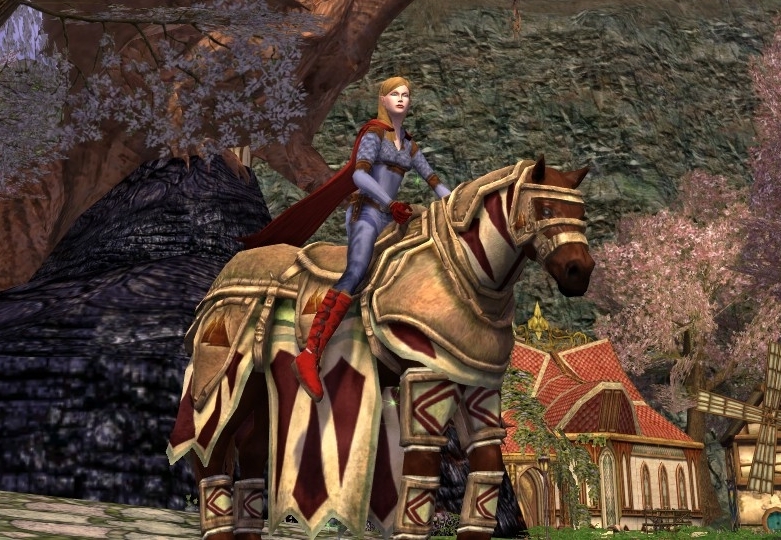 They are identical and both utilize the skill Bree-horse or Bree-pony; you are barred from owning both Bree-steed and Bree-starter since they are identical with different names and reference the same skill. lol Digger, I have no idea. Mebbe those are the girl horses in fancy dresses. Okay, that explains why I have not seen the Prized Easterling Horse before. But I had a lot of tokens, so I just bartered it out. Thanks for the information about the Bree-horse. I thought I was never going to get this horse, since I am not a founder. 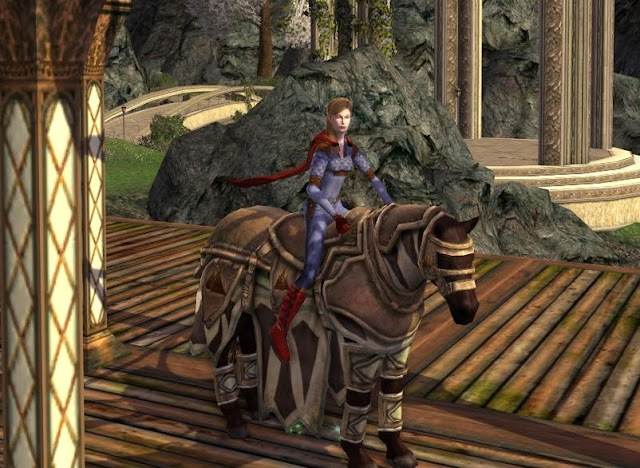 I am happy to hear that you can only own one of the Bree-horse/Bree-starter horse. I will delete that one from my list then. I think we can agree on 110. My collection is not as big as yours, but I hope to get some more soon, but the ones I am missing are the hardest ones to get. 101/110. However, I am sorry to inform you there is a horse you are (I suppose) not aware of, and, indeed, it is only available as a special gift in the box version sent by the FNAC, a french retail chain of cultural goods. This is the horse of red dawn (Monture de l'Aube Rouge, http://jolstatic.fr/www/captures/1741/0/58490.jpg). I don't know if there are other offers like this one in other countries, but that would inflate the number of available horses. Oh wow, thanks Svein! That is great information. I cannot find that intell anywhere. Is that you on the horse in the picture? On which server do you live? The horse looks so very familiar... but I cannot place it. I know I have seen it in-game, somewhere, mebbe like an NPC or stablemaster. However, I would guess that it is a very unique steed since it might only have been for sale from that one outlet? I am about to go on vacation but will make a note to look for it at the Stable-masters when I return. I am not the one on the horse, it's Ahradir from Sirannon (which is my server). It looks a liitle bit like the eastemnet steed, but in red. It is only available through this CD version here (http://jeux-video.fnac.com/a4622157/Le-Seigneur-Des-Anneaux-Online-Les-Cavaliers-Du-Rohan-Jeu-PC), still in stock (for ca. $51) if you are available to buy it from where you are. 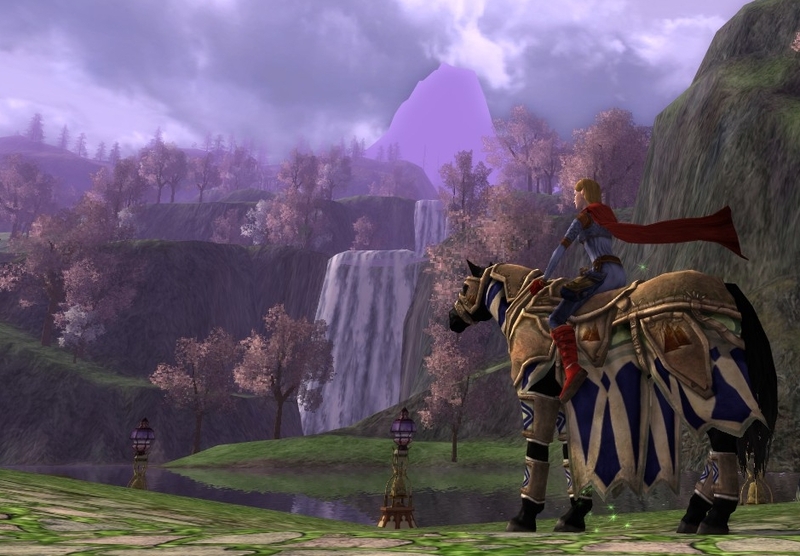 It includes all the bonuses from the digital version (eastemnet steed, title,...) + this steed. Even for the exclusive horse, it was too redundant for me to buy it. I like steeds, but am not a completionist like you (though I would love to). I find it too expensive to buy all the horses from the store, so I please myself from time to time. I only own 79 of them.